The 2018 Winter Olympics will have the greatest African representation ever. But it’s the Nigerian women who will compete in the bobsleigh and skeleton event who are among the most remarkable. By ANTOINETTE MULLER. The 2018 Winter Olympics will begin in Pyeongchang, South Korea on Friday and while South Africa has sent a lone competitor – alpine skier Connor Wilson – the Games will have a broad African representation. In fact, the Games will feature the most African countries at a Winter Olympics. Eight countries from the continent – Kenya, Morocco, Ghana, Madagascar, South Africa, Togo, Eritrea and Nigeria – will compete at this year’s event with 13 athletes (a record since 1994) all vying to become the first African to win a medal. It is a monumental effort considering the challenges the athletes face to compete. Beyond the usual – maladministration, lack of funding and you know, the weather – there’s the added complexity that in many countries, the federations that govern winter sports simply do not exist. When Senegal's Lamine Guèye became the first black African athlete to compete in the games back in 1984, he had to ask for the help from the International Ski Federation to set up the sport's federation. That has been a recurring theme and a similar story for the women who are likely to be the stars of this year’s African show. 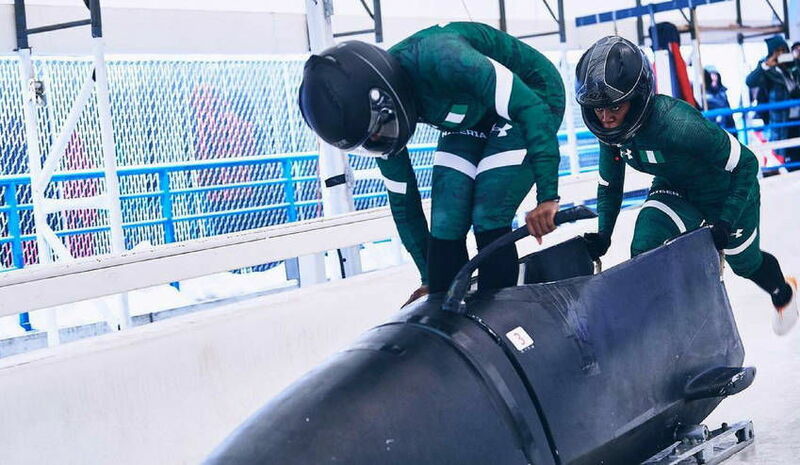 US-based trio Seun Adigun, Akuoma Omeoga and Ngozi Onwumere will make up Nigeria’s bobsleigh team at the Games, while Simidele Adeagbo will compete in the women’s skeleton. It’s the first time the country will take part at the competition, and added to their challenge of actually getting into a bobsleigh, they also had to set up the federation from scratch. It will be a historic moment when the women debut, but elite-level competition isn't foreign to all of them. Onwumere is an All-Africa Games medallist, having won silver in the 200m sprint in Brazzaville 2015 and gold in the 4x100m relay. But the two sports are worlds apart and the journey to get here has been nothing short of remarkable. It started off with a wooden sled in Houston -- built by driver Adigun herself from scrap metal – and breaking three helmets in qualifying. Their story has captured wide media attention, including a visit to the Ellen DeGeneres Show, which was all sorts of wonderful. “Everybody is going absolutely nuts. The crazy thing about it is most people don’t really understand what bobsleigh is but they don’t care. They just know the flag is raising high, and they are excited about it,” Adigun told DeGeneres when asked about the reaction in Nigeria. That all four women were born in the United States doesn’t matter. Like many expats in the African diaspora, they all understand the broader vision and the impact they can have on the lives of others. “After realising that my participation as a brake man on the United States women’s bobsleigh team had grown to be far larger than me, I knew this was something I had to do. I noticed my ability to potentially empower and positively influence millions of people resided in my decision to give back to the country of Nigeria,” Adigun said in an interview with sheleadsafrica.org. And Adigun was right. With the widespread attention their ambition of becoming Africa's first-ever bobsleigh team got, Adeagbo, who will become the continent’s first ever skeleton racer at the 2018 Winter Olympics, had her interest piqued. Adeagbo, who was born the in the States to Nigerian parents but living in Johannesburg where she worked as running brand manager for Nike, got in touch with the trio via social media after reading about their story. Adeagbo figured bobsleigh is a four-person sport and she wanted in, only to be told it's only men who race in fours (the women race in twos). Her dreams weren’t completely dashed. A seed was planted and she kept pondering. In July 2017, she saw a call for try-outs for the Nigerian Bobsleigh and Skeleton Federation in the most unlikeliest of places – Houston, Texas.